The first thing I noticed when I got the BatteryPro out of the box was the simple but solid look and feel. The body is all plastic, but it doesn’t feel cheap at all. Not even close. The combination of the weight and balance and the rigidity of the plastic body actually feel quite premium. Another thing I noticed was that the texture of the plastic exterior also dresses things up a bit. The subtle embossed logo is another nice touch, as well. I’ve seen enough plastic accessories in my time to know how easy it is to miss the mark when it comes to design and feel. ElevationLab isn’t playing around, and their chops are clear the moment you put the BatteryPro in your hand the first time. 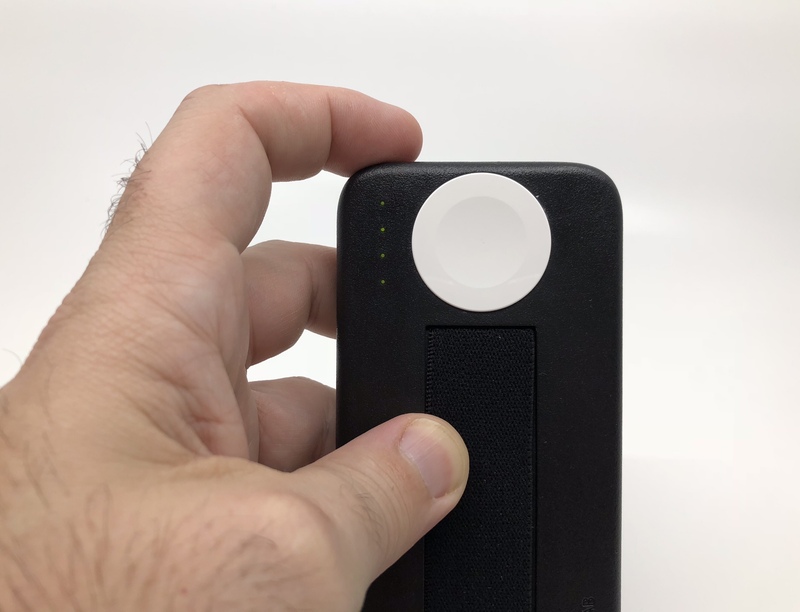 This may sound almost contradictory after talking about how solid it feels in the hand, but another thing that immediately stood out to me was that the BatteryPro feels lighter than I would expect for a 8,000mAh capacity battery pack. I have owned and tested plenty of these over the years, and most that come in close to 10,000mAh are quite heavy, especially when it comes to carrying around in a pants pocket. I much prefer the overall design and construction of the BatteryPro over Belkin’s Valet Charger for this reason. Even though the Valet is smaller, I much prefer the durable plastic and combo of lighter weight and feel and higher capacity of the BatteryPro. If that was all there was to the BatteryPro, it would probably be a success in terms of design. However, there is quite a bit more to this device. 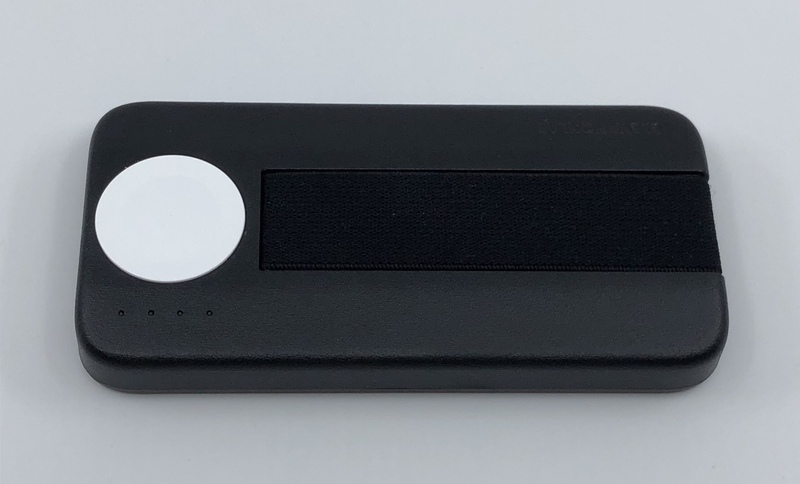 First off, as I already mentioned, the standout feature is the built-in MFi magnetic charging pad for the Apple Watch. 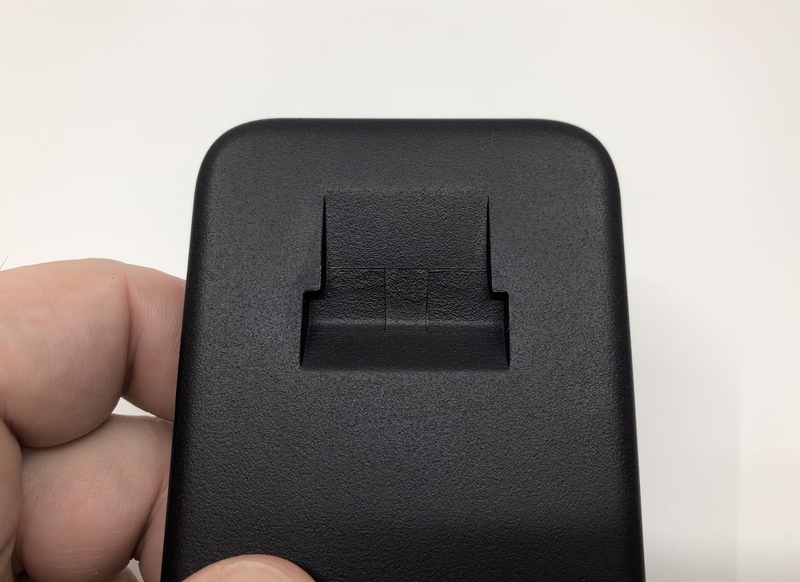 This is such a key feature for anyone who either needs to top off their Watch during the day, or travels often and doesn’t want to have to worry about bringing their Watch’s special charge cable on the road. The magnetic charging pad on the BatteryPro works just fine, but one thing I did notice is that it is a tad weaker than the stock Apple charger, or either the Belkin Valet or the Griffin Travel Power Bank. Also, because the BatteryPro is quite a bit wider than the Watch, it can be a challenge to get solid contact with certain bands. I am currently using one of the new Sport Loop bands, and it takes a little adjustment to get it to sit flat against the pad, as seen below. This won’t be a problem with Sport Bands, Woven Nylon Bands, or others that separate when taken off the wrist. It only comes into play with those that remain in a loop, like the Sport and Milanese Loop Bands. However, once you do get your Watch seated properly, the magnet is able to hold just fine. As you can see below, my Apple Watch Series 3 is held securely while turned upside down. 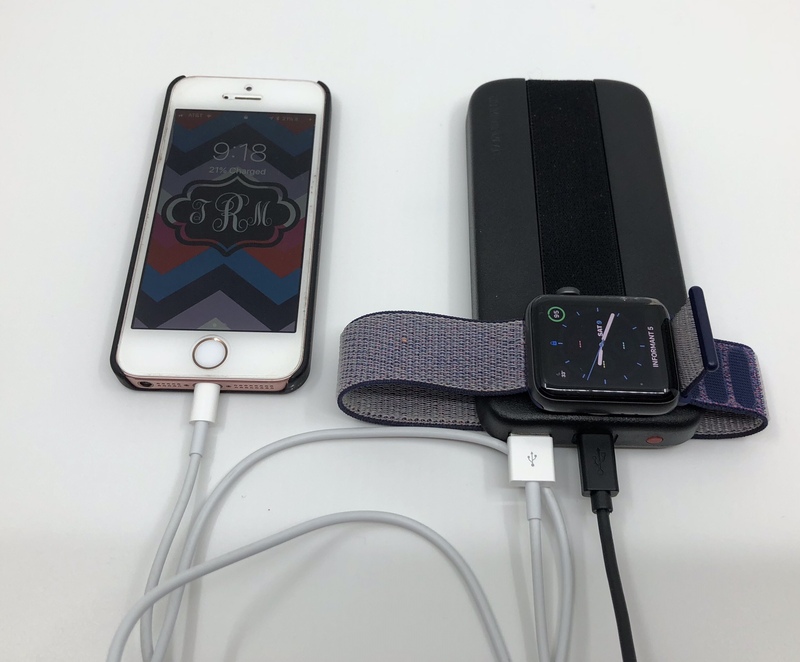 While we’ve established that the magnet on the charging pad holds well enough, the most unique feature of the BatteryPro adds a little extra security if you want to charge your Apple Watch while carried in a bag or pocket. 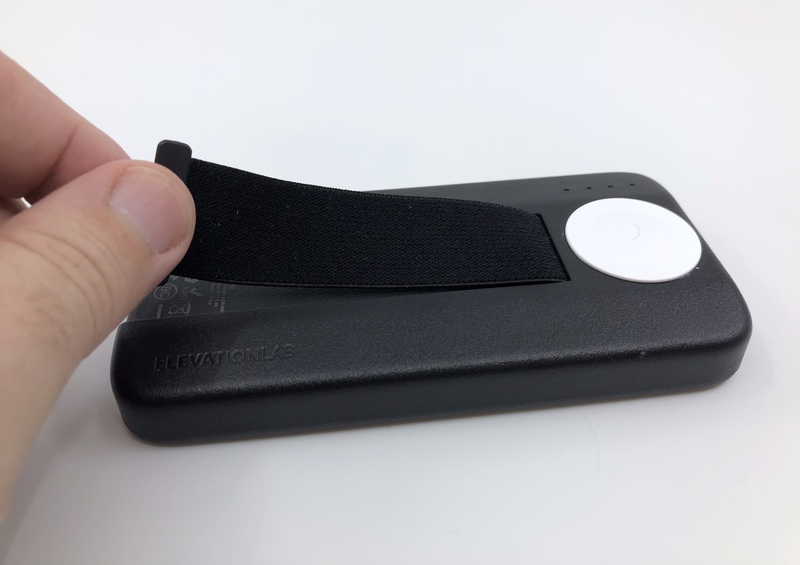 This battery pack has a built-in nylon strap, which ElevationLab refers to as a StowStrap, that is designed to hold the Watch securely in place. Thanks to this feature, the magnet being a tad bit weaker than the competition isn’t such a concern. 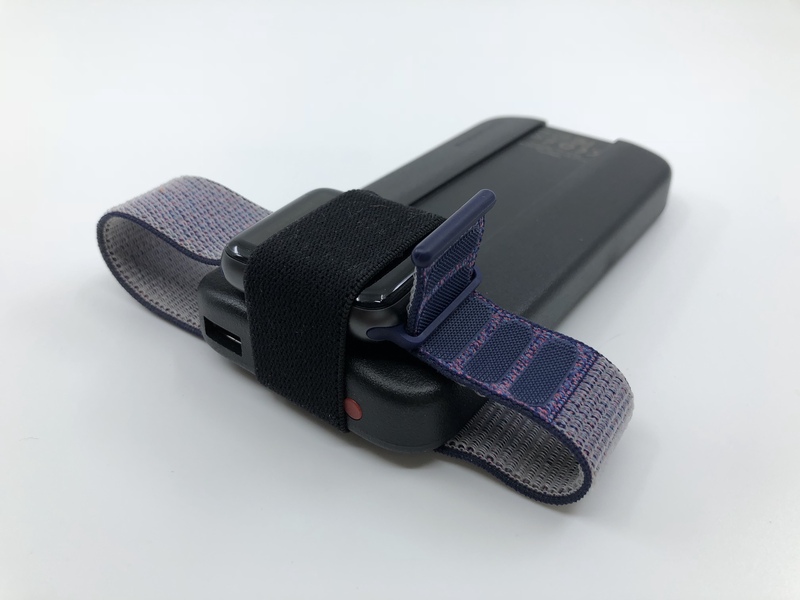 As you can see above, the strap blends perfectly into the overall design, sitting in a groove cut in the top when not in use. The strap has a plastic tab at the end that is held securely in place behind a recessed area at one end of the BatteryPro. 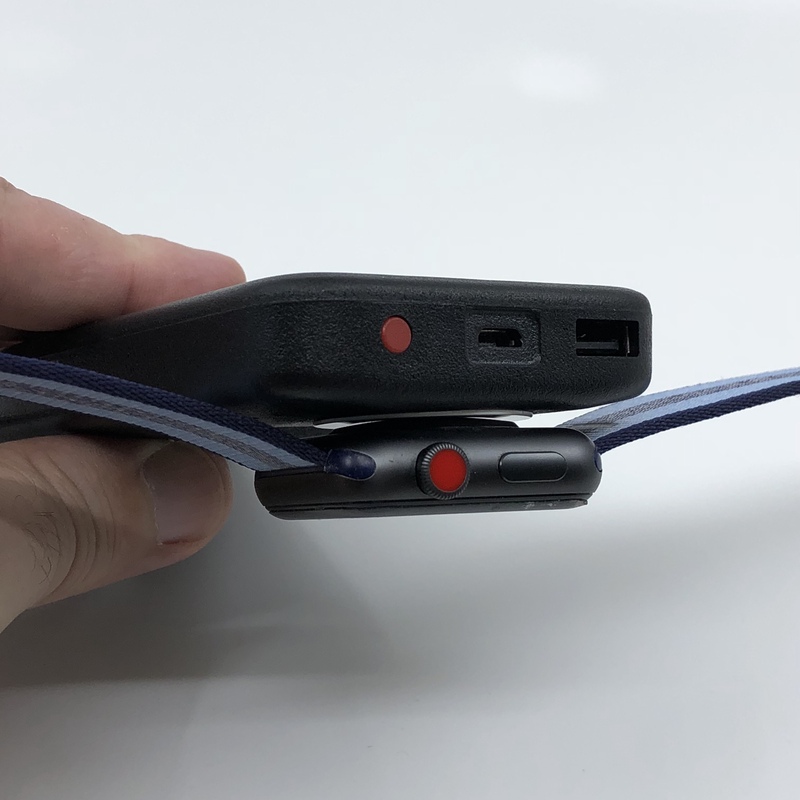 When the strap is stretched over a Watch installed on the charging pad, it is held securely on the other side by a cutout on the bottom of the BatteryPro. As you can see below, the strap fits tight enough across the Watch to secure it to the charging pad, even if it is moved around or shifted. To test this out, I carried the BatteryPro with my Watch attached and charging in a cargo pants pocket. I took it out and checked it several times, and my Watch never lost connection and was fully charged when I returned home. 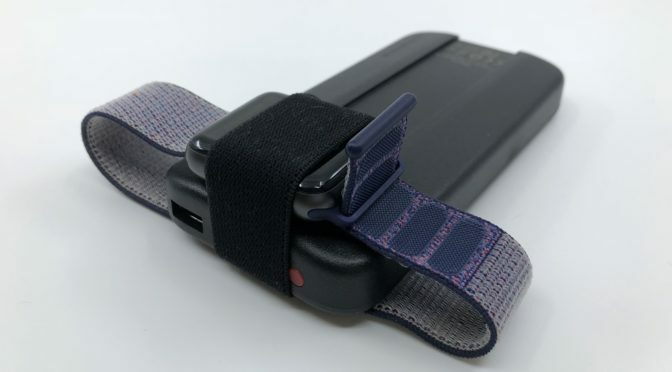 If it can handle the constant shifting of me walking around at a store and getting in and out of a car, then the BatteryPro’s StowStrap passes my test. While the standout features of the BatteryPro are Apple Watch-related, it still pulls its weight as a standard USB charger, as well. While my RAVPower 26,800mAh has more capacity, fast-charge capability, and more ports, it could also double as a boat anchor in a pinch. You would not want to carry it in a pocket, and frankly, it isn’t designed with that in mind. The BatteryPro is, and while it only has one USB-A output port, you will get plenty of mileage out of it. The USB port outputs 2.4A, which makes it more versatile than even ElevationLab touts on its website. While they focus on its use with an iPhone, 2.4A is the same output that you would get from the stock 12W iPad/iPad Pro Charger. In fact, I am charging my 12.9″ iPad Pro with it as I write this. It took my iPad from 52% to 69% while in use while only dropping one out of four LEDs on the battery indicator. The BatteryPro does heat up a bit when taxed to the limit, and this is not something that I would recommend doing all the time, but it’s good to know that it can handle this task in a pinch. While the BatteryPro may be an adequate stand-in for topping off your iPad Pro when needed, it’s even better at charging iPhones of all sizes and capacities quickly. Just as with the 12W iPad Charger, the 2.4A output will charge an iPhone almost as fast as a compatible 29W USB-C Fast Charger. The 8,000mAh capacity means that you should be able to get a full iPhone Plus or X recharge and a partial second. One issue I had with the Belkin Valet was that you couldn’t charge a device and re-charge it at the same time. 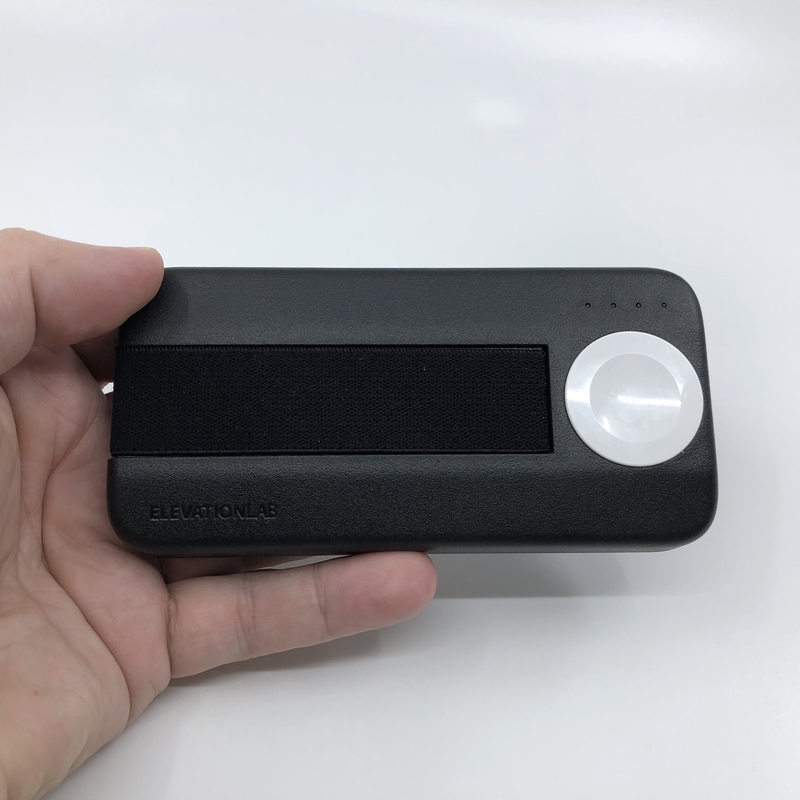 This meant that if you used it to charge both an iPhone X and Apple Watch while on the road, you would leave the hotel with a quarter or less of battery capacity remaining. The BatteryPro does not share this limitation, which is a big plus, in my opinion. When I am on the road, I can use one charging brick to charge my iPhone X, my Watch, and recharge the BatteryPro. And when I leave for the day, my battery will be at full capacity and ready to roll when called upon. That’s the kind of versatility that earns an accessory a spot in a mobile gear bag. 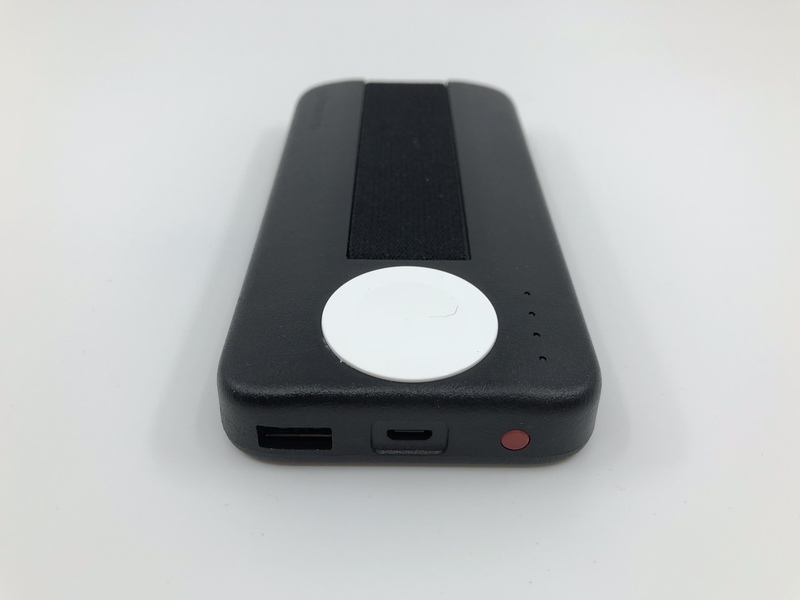 ElevationLab’s BatteryPro strikes the best balance I have ever seen in a portable battery pack. It is well designed, looks professional, is rugged enough for life on the road, but is also still light enough to be easy to carry. 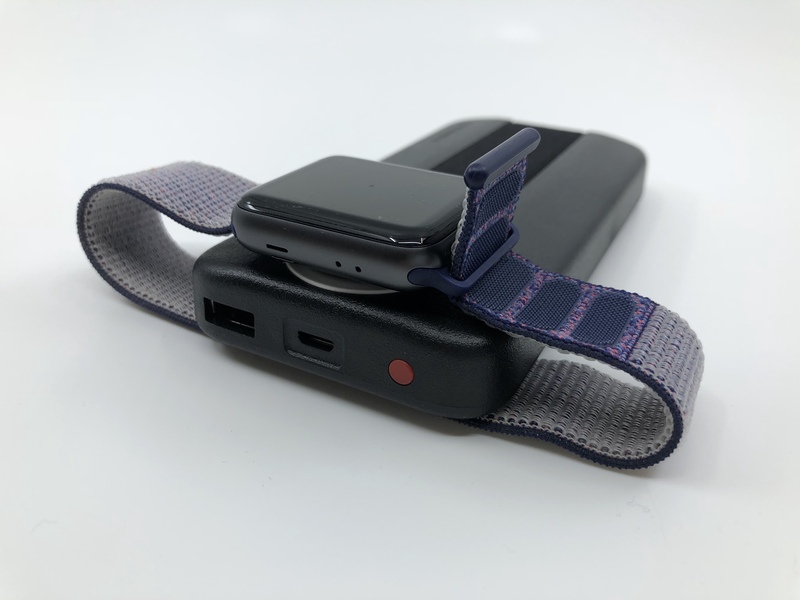 The built-in strap makes Apple Watch charging reliable and secure, and the output capacity of the USB charging port can recharge an iPhone quickly, and can even top off an iPad or iPad Pro in a pinch. The BatteryPro checks all of the boxes. I will admit that the BatteryPro’s $99 retail price tag is a big bite for a battery pack. 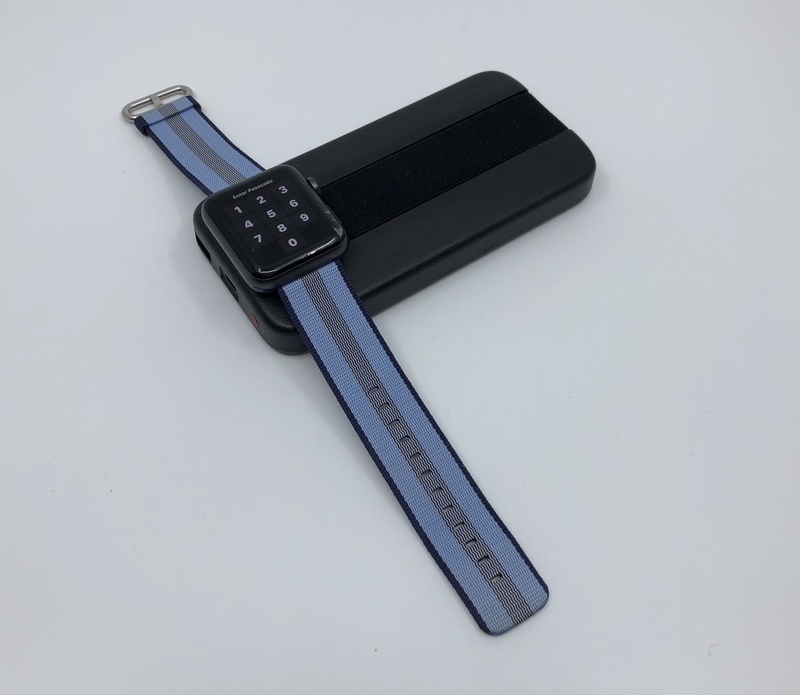 There are less expensive products on the market that don’t have the MFi-certified Apple Watch Magnetic Charging Pad, but do have greater battery capacity, and there are others that have the built-in charging pad included for a lower price, but less battery and output capacity. The Belkin Valet Charger, is one such product that is close in terms of features and capacity that I have personal experience with. However, in my opinion, the BatteryPro is the better option and worth the price because of its combination of quality, features, and the reputation of the brand behind it. Again, the versatility it brings to the table makes it an ideal accessory for those who travel, and that is definitely worth a few extra dollars to someone like me. 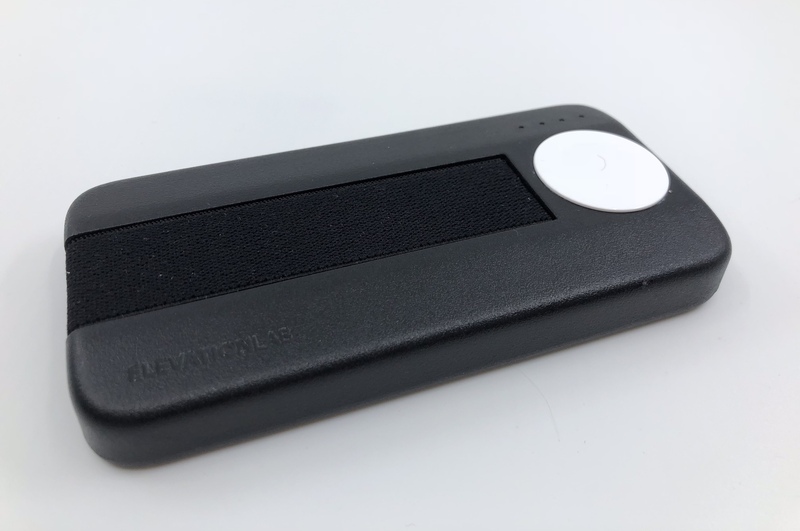 The ElevationLab BatteryPro is available from ElevationLab for $99 here. It is also available at Amazon here, and the Apple Online Store here, if you prefer. Your local Apple Retail Store may also carry it in stock. The BatteryPro was provided by ElevationLab for review on iPad Insight. For further information regarding our site’s review policies, please see the About page. I looked and frankly, I’m not blown away. This isn’t an established company, the prices aren’t that much cheaper, and I don’t see a model with an MFi-certified Watch Charger amongst their vaporware on Twitter. If they get ramped up, get their patents together, release some hardware, and then want to send me something to review, I would be happy to. But just looking on the surface, I’m going to go with the known quality offering from a company with an established reputation. I need more than pics and specs on a Twitter account to be impressed.